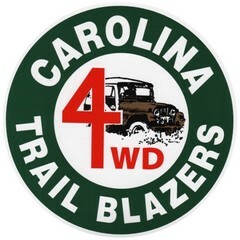 The Carolina Trail Blazers 4WD Club is a family oriented club formed in 1971 and incorporated in 1973. We ride trails of varying difficulty and most of our club rides are on trails that are suitable for every type of rig from stock vehicles to purpose built rock buggies. We "Tread Lightly" to minimize the ecological impact of our hobby and try to leave the trails a bit cleaner than we found them. CTB is a Volunteer Partner with the U.S. Forest Service on the Uwharrie OHV Trail system and participates in scheduled, monthly Forest Service workdays to help maintain the trails, usually the third Saturday of each month. Most of our club members live in the central N.C. area but we also have members from VA, S.C., GA and TN. Our scheduled club trail rides usually take place on the weekend of the second Saturday of the month. Sometimes there will be an alternate ride for those not able to do the primary ride. A general club meeting is held during the monthly club ride. If you are interested in becoming a member of the Carolina Trail Blazers, contact one of our officers (http://www.carolina-trailblazers.org/Officers.htm) and attend one of our club rides from the Ride Schedule (http://www.carolina-trailblazers.org/Ride_Schedule.htm).